 From Galbraith, now 85 and professor emeritus at Harvard, a personal, idiosyncratic, and thin history of the economics of the century. Relying mostly on ``experience, observation and reflection. And on a reasonably capacious memory,'' this book is not going to make Galbraith's reputation for authoritative analysis. Nor does he deal with much care with the views of those with whom he disagrees: He notes that one economist ``held, in early anticipation of Ronald Reagan, that the economic system rightly rewarded the rich for their contribution to general well-being and wisely punished the poor for their inadequacy.'' This is good knockabout stuff, but not really scrupulous economic history. 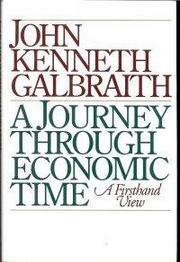 But Galbraith's views are not always predictable. Although he is conventional enough in holding that WW I was the great turning point in modern economic history, that Churchill's decision to return Great Britain to the gold standard at the old exchange rate in the 1920s was an unqualified disaster, and that Keynes saved the capitalist system, he also refers to the ``dark side of the Keynesian system,'' the resistance in good times to reducing the deficit that has been accumulated in the bad. He also breaks with political correctness in calling the belief in the transition in the post-WW II period of new nations from colonialism to secure self-governing systems ``one of the great errors in history.'' In his usual disarming and self- deprecatory way he admits to not foreseeing the eventual failure of the Soviet system. Perhaps more damaging to his reputation as a seer, however, given some recent positive economic indicators, is his asking whether the American economy has now entered a new phase that will be characterized by a high level of unemployment and a minimal rate of growth. Galbraith still writes better than any of his colleagues, but this material is more suitable to an after-dinner speech before a mellow and pleasantly partisan audience.